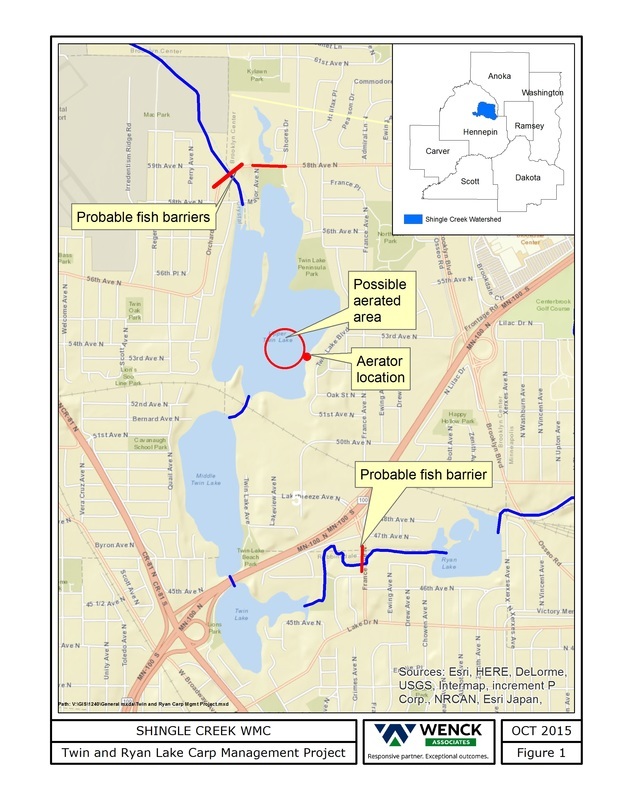 The three interconnected basins of Twin Lake - Upper, Middle, and Lower - and the downstream Ryan Lake have been the focus of study and improvement for several years by the Commission and the cities of Brooklyn Center, Crystal, Robbinsdale, and Minneapolis. Both Upper and Middle Twin Lakes are considered Impaired Waters by the State of Minnesota because summer phosphorus concentrations are too high. Lower Twin and Ryan were also considered Impaired Waters but have since been "Delisted" as the average water quality now meets state standards. Much of the recent focus has been on reducing the load of nutrients coming into the lakes through storm sewers and channels, and significant progress has been made. Focus has now turned to reducing nutrients that are already in the lake, in the sediments and vegetation. Shallow lakes such as Upper and Lower Twin Lakes have a very sensitive ecology. The fish and zooplankton communities must be properly balanced, and there must be an abundant and diverse submerged aquatic vegetation community in order to sustain a clear-water state. 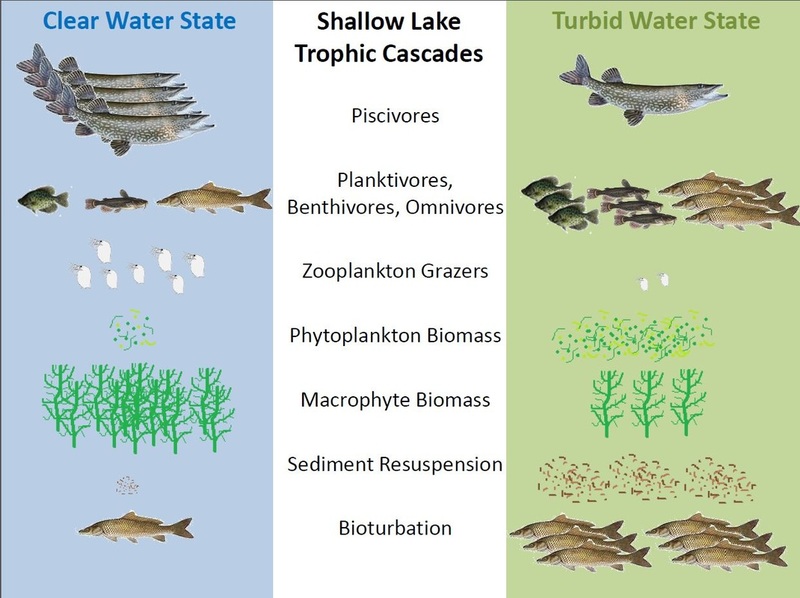 If any of the those conditions change, then the lake will "flip" to a turbid water condition in what's called a trophic cascade. Carp are often one of the culprits in trophic cascades. Bottom feeders, they root around in the sediments, eating tender aquatic vegetation. Sediment gets suspended in the water column, making the water murky and reducing light to help grow more plants. As submerged vegetation is lost, their roots no longer stabilize the bottom sediments, making it easier for wind and boat action, to stir up them up even more, further reducing visibility. The phosphorus attached to the sediment can get released into the water column, which causes more algae blooms. The daphnia zooplankton can't keep up with consuming that much algae. Predator fish find it hard to hunt in the murky water, so they start to die out. And so on, in a cascade of effects started by the presence of too many carp. Managing carp is the first step in improving shallow lakes. Click here to find out more about the 2016-2017 carp tracking project. The Shingle Creek Commission received a $100,000 grant to help track and remove the carp and make other improvements. Click here to find out about the next steps to the Twin Lake Project - submerged aquatic vegetation management, carp migration barriers, and winter aeration.